Our surname’s origin comes from the Alpine region of Italy, near the border of France. 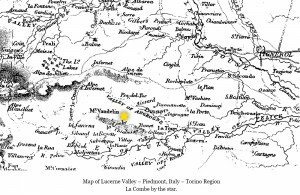 A small village there called La Combe [Combe meaning the uppermost part of the valley] is situated in the Valley of Lucerne [Valley of Light], at the foot of Mt. Vandelin. From this originated the name Des Las Combes. Cities nearby are Rorá, Torre Pellice, and Malpertus. 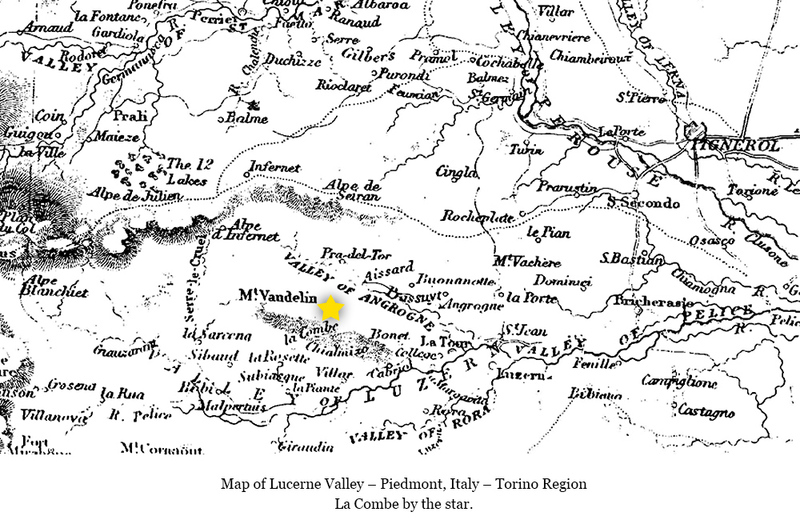 This area was home to the Waldenses [Vaudois or Valdesi] who had existed since the time of the apostles, and were believed to have possessed the first translation of the New Testament in the twelfth century. During some of the persecutions of the Waldensesian people by the Catholic Church in the 1480’s, these people passed over the Alps into France and became identified with the Huguenots of Languedoc. 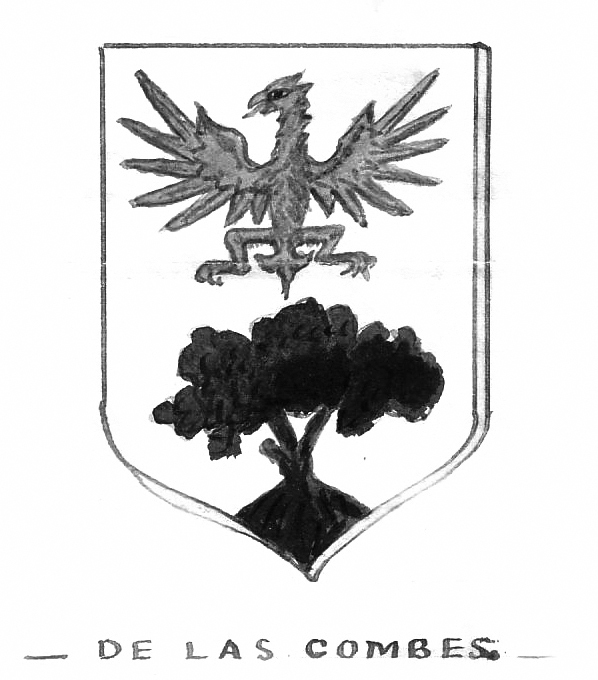 Click here to read chapter 14 from “The History of the Waldenses” – “Exploits of Gianavello–Massacre and Pillage of Rora-Ascent of La Combe…” by J.A. Wylie. The Huguenots were members of the Protestant Reformed Church of France during the 16th and 17th centuries. French Protestants were inspired by the writings of John Calvin in the 1530’s, and were called Huguenots by the 1560’s. By the end of the 17th century and into the 18th century, roughly 500,000 Huguenots had fled France during a series of religious persecutions. They relocated to Protestant nations, such as England, Wales, Scotland, Denmark, Sweden, Switzerland, the Dutch Republic, the Electorate of Brandenburg, Electorate of the Palatinate (both in the Holy Roman Empire), the Duchy of Prussia, and also to Cape Colony in South Africa and several of the English colonies of North America which were willing to accept them. “One family at least settled in the town of Whippingham, Isle of Wight, and from this is descended the Sir Thomas Larcom who became Under Secretary of Ireland and was made a Baronet. 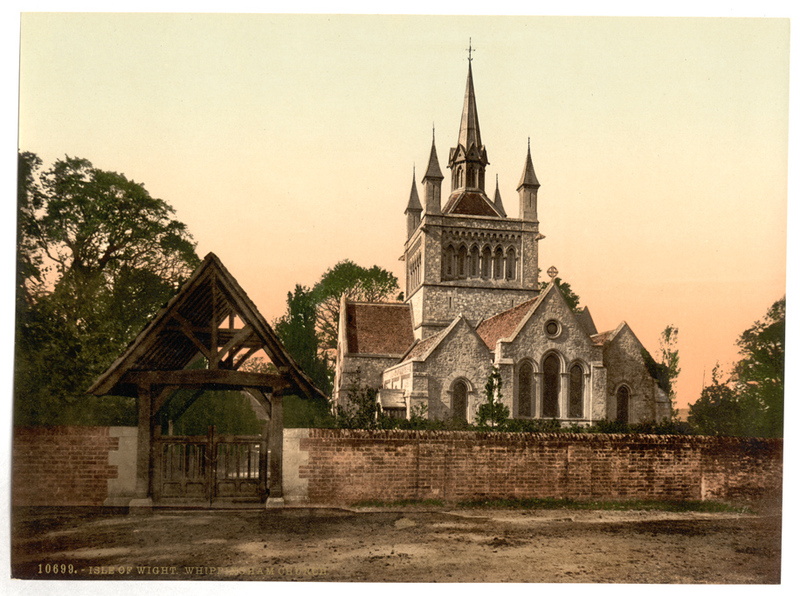 ‘Thence after some years passed over to Bristol, England and then one of the brothers of the family sailed to America.’ Unfortunately, the records of the church at Whippingham have been burned, and so all the data about the earlier Larcoms have perished. The traditions of the Isle of Wight Larcoms and the Connecticut branch of the Americans agree in this story of the origin of the family.” – G. A. Lewis of Philadelphia, who for many years and at considerable expense made researches concerning the history of the Larcom family. Records show that a Larcom left France for the Isle of Wight in 1600, and that a William Latcome sailed to America on the ship Hercules departing from London on March 24, 1633/34 and Southampton on April 18, 1634, for New England. From here, Ipswich records give a Mordecai Larcom who appeared in Ipswich, Mass., in 1640. Mordecai could have been a brother or son of William Latcome. 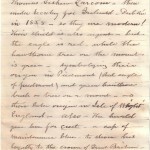 “And then he was but a simple yeoman, a tiller of the soil; one who must have loved the sea, however, for he moved nearer and nearer towards it from Agawam through Wenham woods, until the close of the seventeenth century found his descendents – my own great-great-grandfather’s family – planted in a romantic homestead-nook on a hillside, overlooking wide gray spaces of the bay at the part of Beverly known as ‘The Farms.’” – Lucy Larcom, A New England Girlhood. 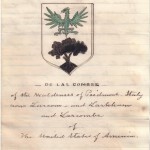 “De Las Combes of the Waldenses of Piedmont, Italy now Larcom – and Larkham and Larcombe of The United States of America.” “There is a family shield in existence, showing a hill surmounted by a tree, and a bird with spread wings above. It might symbolize flight in times of persecution, from the mountains to the forests, and thence to heaven, or to the free skies of this New World.” – Lucy Larcom, A New England Girlhood, 1889 (The Riverside Press, Cambridge, Mass., USA), 19. This shield was drawn by Gilbert Philips, dated March 7, 1902. 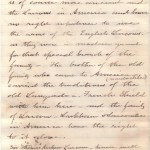 It is part of a letter sent to William F. Abbot who wrote Genealogy of the Larcom Family published in the early 1900’s. 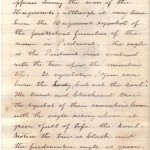 This letter describes in great detail the Larcom Family Shield, what it means, and why we have it. I am so honored to have this letter. A copy was e-mailed to me by a great friend and distant cousin, Qunicy S. Abbot.